A great solution for art projects and classroom clutter! 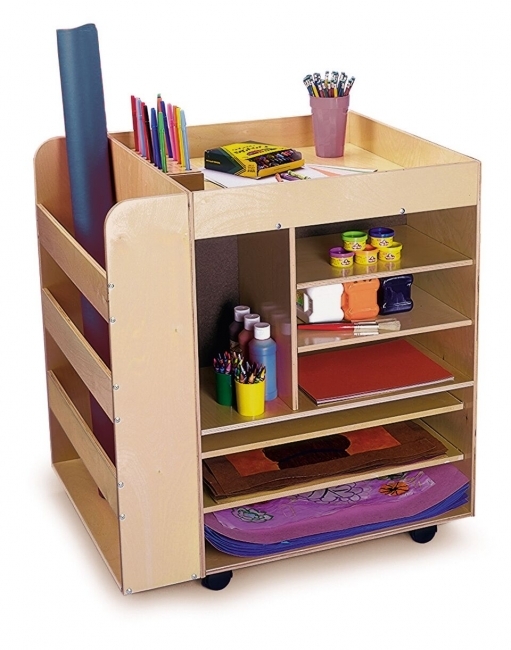 This handy cart rolls over to your next art project and makes organization a snap. Two sides feature shelves and compartments to organize and store supplies and paper, and the third side includes a deep bay to store large paper rolls. Heavy duty casters included. Large shelves = 23"W x 23.75"D; medium shelves = 15"W x 11.75"D; small shelves = 7.5"W x 11.75"D; side pocket = 23"W x 5"D.
Need to move a lot of books? 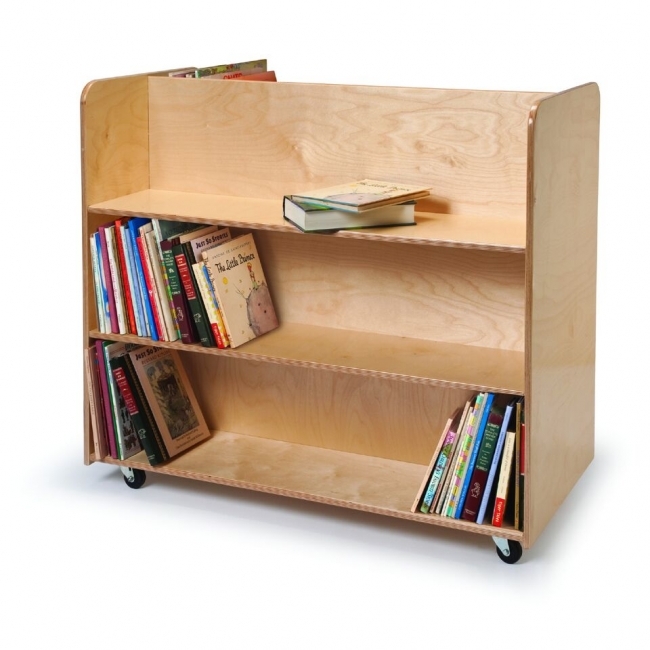 Your task is easy with this rugged, functional books storage cart. Three fixed shelves on both sides accommodate a payload of reading material, including oversized books in the open top shelves. 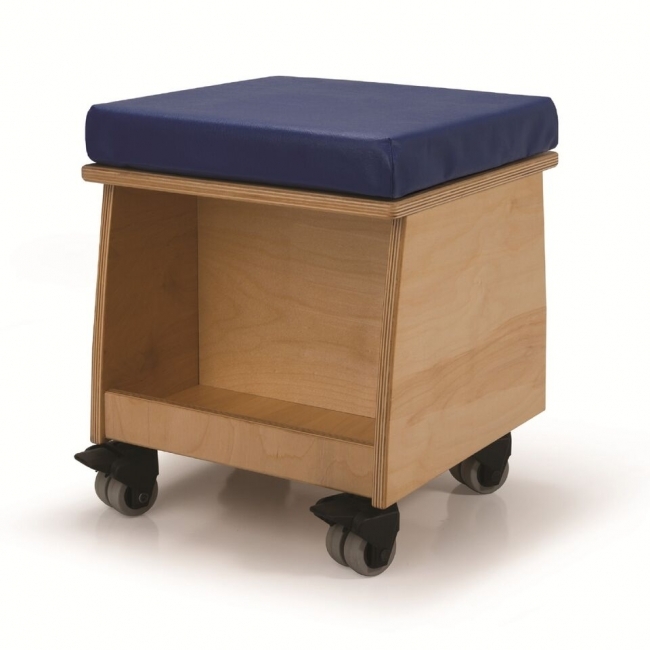 Mounted on lockable heavy duty casters that provide smooth and easy transport to new destinations. Constructed in beautiful, durable birch plywood in safe, non-toxic natural UV finish that won't yellow and withstands rigorous use by children. Dimensions: 20"D x 40"W x 35"H, weights 64 pounds. Ships fully assembled by truck. GreenGuard? Gold certified. Made in USA. Lifetime Warranty. This sleek book case with a fixed shelf is perfectly proportioned for use in corners or other confined areas when storage in a smaller footprint is essential. 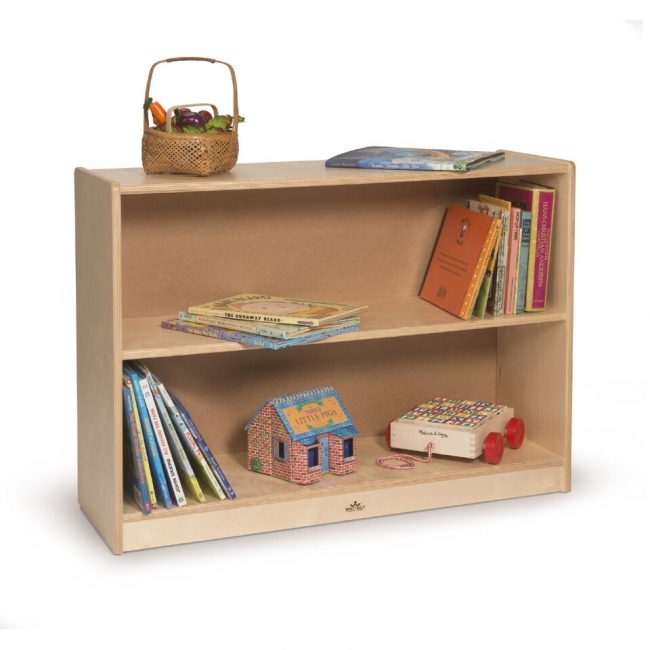 Constructed in beautiful, durable birch plywood with no visible screws or joinery for a fine finished furniture look. Stow and go! Just the right size with hand-hold cutouts and a whimsical graphic that inspires children to pick up after play. The bin is mounted on heavy duty lockable casters so toys can be easily transported out of the way. Mirrors are important tools that help to build a young child's self-awareness, self-esteem and cognitive development, and that's why our Mood Mirrors are essential furnishings for every Early Learning classroom. 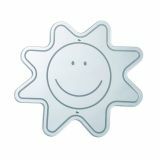 The facial features of our Happy Face Mirror are etched into safe, shatterproof acrylic and and help a child identify, understand and express their mood. 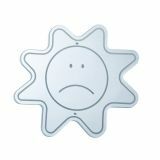 Assemble the full range of Mood Mirrors for your room environment: WB0036 Sad Face Mirror, WB0037 How Do I Feel Today? Mirror, WB0038 Surprise Face Mirror, WB0039 Angry Face Mirror, WB3567 Mood Mirrors 3-Pack or WB3569 Mood Mirrors 5-Pack [each sold separately]. Attaches to a wall or other surface [mounting hardware not included] or can be hand held. Mirrors are important tools that help to build a young child's self-awareness, self-esteem and cognitive development, and that's why our Mood Mirrors are essential furnishings for every Early Learning classroom. 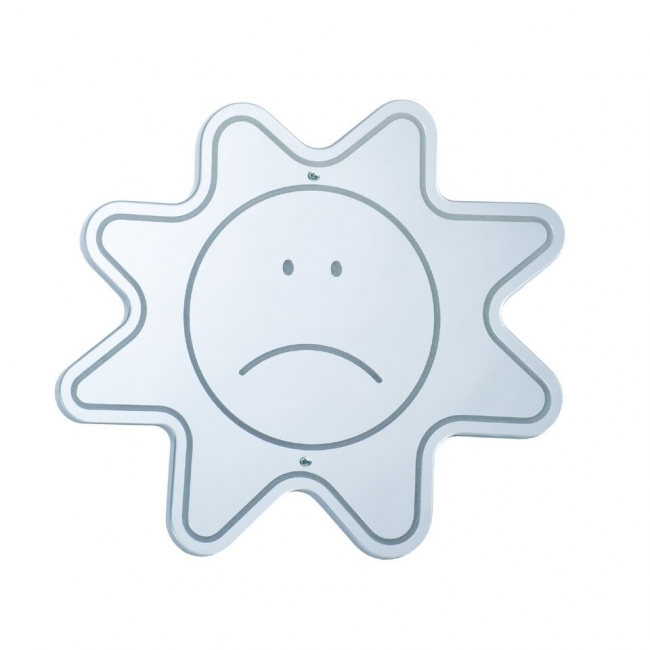 The facial features of our Sad Face Mirror are etched into safe, shatterproof acrylic and help a child identify, understand and express their mood. 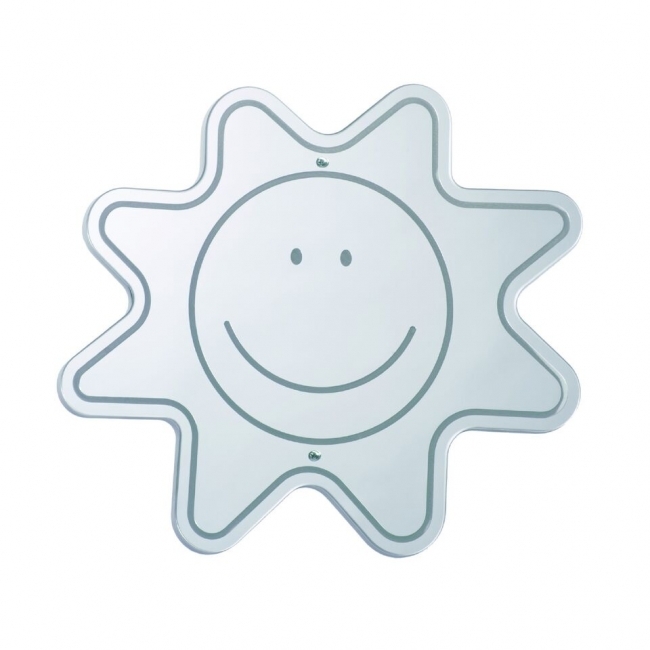 Assemble the full range of Mood Mirrors for your room environment: WB0035 Happy Face Mirror, WB0037 How Do I Feel Today? Mirror, WB0038 Surprise Face Mirror, WB0039 Angry Face Mirror, WB3567 Mood Mirrors 3-Pack or WB3569 Mood Mirrors 5-Pack [each sold separately]. Attaches to a wall or other surface [mounting hardware not included] or can be hand held. Mirrors are important tools that help to build a young child's self-awareness, self-esteem and cognitive development, and that's why our Mood Mirrors are essential furnishings for every Early Learning classroom. The features of our How Do I Feel Today? Mirror are etched into safe, shatterproof acrylic and help a child identify, understand and express their mood. Assemble the full range of Mood Mirrors for your room environment: WB0035 Happy Face Mirror, WB0036 Sad Face Mirror, WB0038 Surprise Face Mirror, WB0039 Angry Face Mirror, WB3567 Mood Mirrors 3-Pack or WB3569 Mood Mirrors 5-Pack [each sold separately]. Attaches to a wall or other surface [mounting hardware not included] or can be hand held. Mirrors are important tools that help to build a young child's self-awareness, self-esteem and cognitive development, and that's why our Mood Mirrors are essential furnishings for every Early Learning classroom. The facial features of our Surprise Face Mirror are etched into safe, shatterproof acrylic and help a child identify, understand and express their mood. 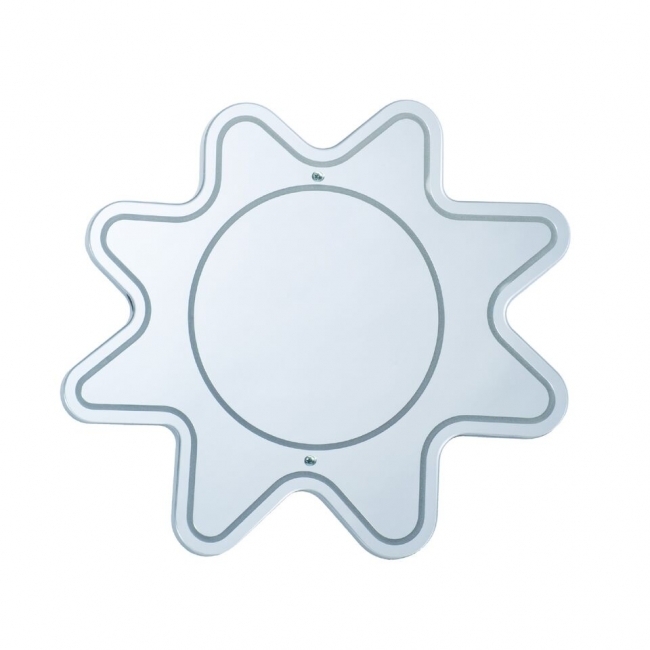 Assemble the full range of Mood Mirrors for your room environment: WB0035 Happy Face Mirror, WB0036 Sad Face Mirror, WB0037 How Do I Feel Today? Mirror, WB0039 Angry Face Mirror, WB3567 Mood Mirrors 3-Pack or WB3569 Mood Mirrors 5-Pack [each sold separately]. Attaches to a wall or other surface [mounting hardware not included] or can be hand held. Mirrors are important tools that help to build a young child's self-awareness, self-esteem and cognitive development, and that's why our Mood Mirrors are essential furnishings for every Early Learning classroom. The facial features of our Angry Face Mirror are etched into safe, shatterproof acrylic and help a child identify, understand and express their mood. Assemble the full range of Mood Mirrors for your room environment: WB0035 Happy Face Mirror, WB0036 Sad Face Mirror, WB0037 How Do I Feel Today? Mirror, WB0038 Surprise Face Mirror, WB3567 Mood Mirrors 3-Pack or WB3569 Mood Mirrors 5-Pack [each sold separately]. Attaches to a wall or other surface [mounting hardware not included] or can be hand held. 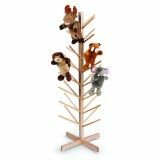 The compact design and 32 durable "branches" hold, organize and visually display all those favorite puppets in one convenient place. This step stool features a simple but ingenious safety design: The guard rail can be installed on either the left or right side and requires the child to turn safely toward the steps -- not backwards like other models -- to look for the hand rail before descending. 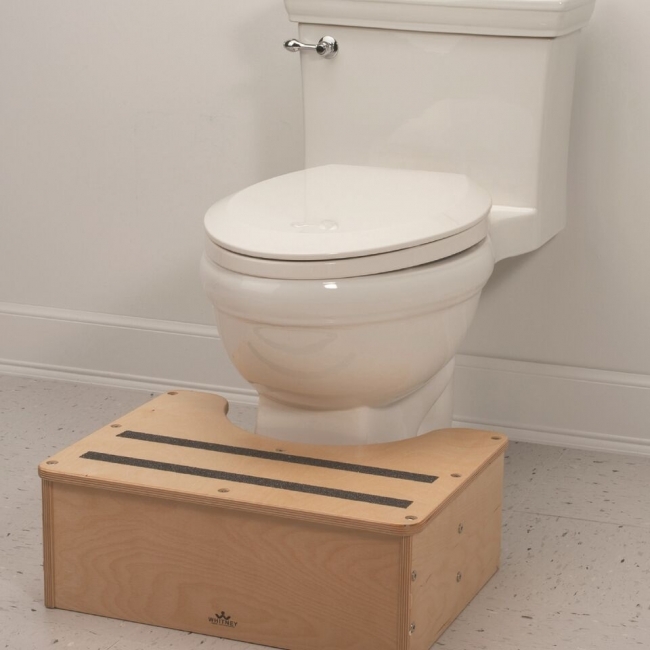 The steps include non-slip treads for increased safety. 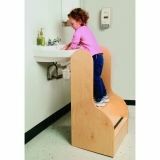 An ingenious necessity for potty trained little folks who need an extra lift. 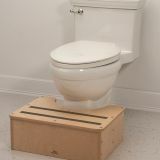 The step includes no-slip treads and fits snugly to provide just the right height for little ones to use a full sized toilet. 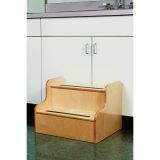 This durable step stool is designed for children who are more sure-footed but not yet tall enough to reach intended targets. 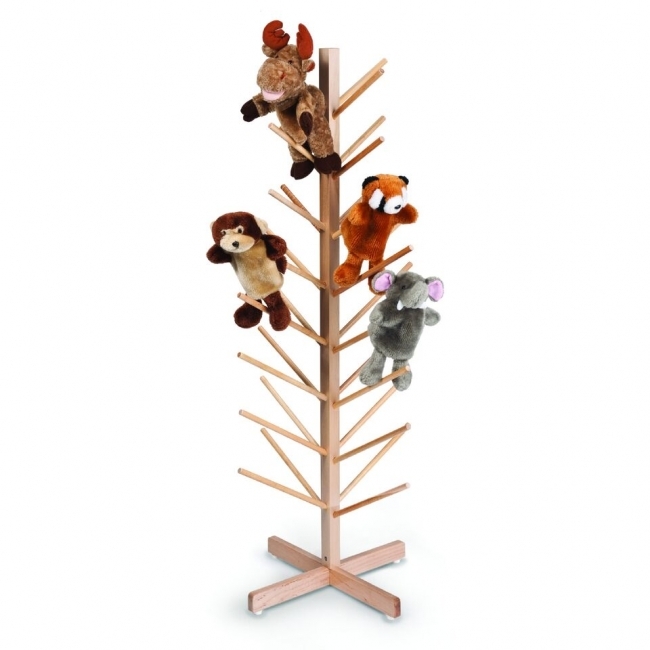 Features include two non-skid treads on each step and smooth rounded corners that provide a very safe climbing experience for a young child. 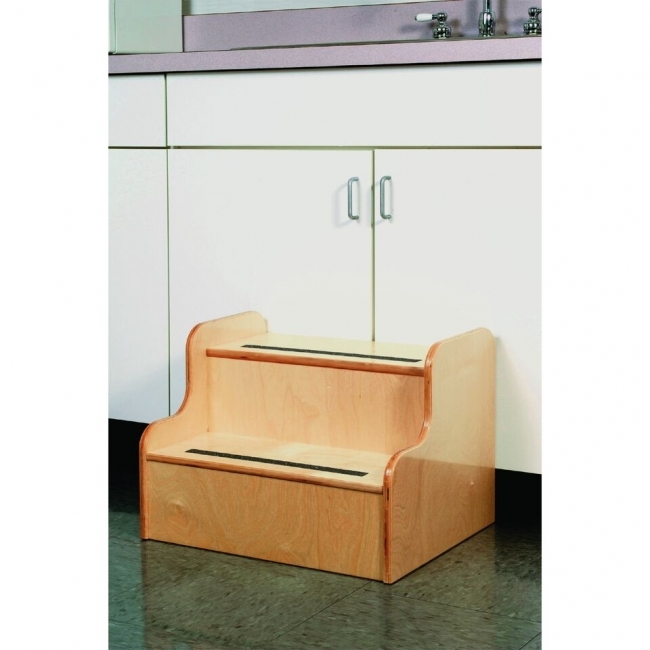 Perfect for the younger, not-so-tall stepper, the high back and sides of this stool provide extra support for leaning against counters and help to prevent missteps. 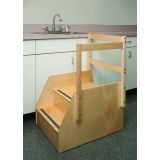 For added safety, each step is trimmed with two non-skid treads and all edges and hand holds are rounded over and smooth. Our handy mobile teacher seat puts a teacher at the ideal height to read or present to curious young minds. 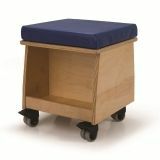 Features rugged non-marking casters that lock, two large open compartments that provide ample storage for books, activities and teaching aids, and 1.5-inch thick vinyl covered high-density foam seat cushion for outstanding comfort.